Every year we help hundreds of restaurants, cafes, takeaways, hotels and homemakers keep their kitchens running efficiently and economically. How you ask? With plastic containers of course! Our range of Food Grade Clear Plastic Buckets provide the perfect accompaniment to any successful kitchen. We understand the needs of our customers and know that freshness is the key to great-tasting dishes. That’s why all our buckets come with air-tight lids to help preserve food integrity as far as possible. We have a container for every food need imaginable. Our large (5/10L) clear containers are perfect for storing soups and sauces in bulk. 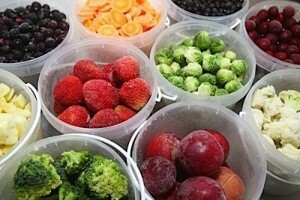 Many customers prefer the medium (2.5L) containers to store fruits and vegetables. And Mums say that the small (1L) containers, starting at just 80p, are the economical alternative to pricey lunch boxes. At H&O we are immensely proud of the quality of our products. Their added durability means that our containers can be transported long distances without coming close to breaking point. Additionally, the easy-stacking design means cluttered kitchens can make the best use of their available space. Most importantly, all of our Food Grade containers are 100% food safe. The containers are manufactured to strict standards using no unidentifiable recycled plastics or dyes. We only use high spec, high impact polypropylene which sits well within the food grade remit. Using lower quality products in the kitchen runs the risk of contaminating foodstuffs. Lower specification plastics not only give food that distinctive ‘plastic-y’ taste, but might also pose a health-risk. In a process known as “leaching” or “migration”, chemicals or dyes from plastic containers can transfer into foodstuffs. The long-term health effects of this process are so far unknown, but many doctors speculate about its harmful effects, especially if these products are microwaved or contain fatty, salty or acidic foods. One additional feature offered on our Food Grade bucket range is tamper-evident lids. These lids help ensure that foods have not been tampered with en-route to their final destination. If the protective seal has been broken, you, or your customers will know that the product’s integrity may have been compromised.